I have advocated for the agency in various ways on many occasions, visited with scientists there for various reasons, and signed petitions in defense of the funding the agency needs and deserves to do its demanding and important work. But that doesn’t change the conclusion here: the FDA is wrong. I hasten to note that I am also a supporter of KIND. The CEO of KIND, Daniel Lubetzky, is also a personal friend, and quite literally one of the best people I know. Leaving aside the usual stuff- loving husband, devoted father, and the like- Daniel has been recognized repeatedly, and appropriately, as a paragon of corporate responsibility. He has made doing the “KIND” thing intrinsic to his company’s DNA. He runs a global non-profit devoted to, of all things, world peace. I love this guy, and I love the company that embraces his exemplary commitment to honesty, integrity, and genuine virtue. I append, as well, that KIND has sponsored two studies in my lab, both resulting inpeer reviewed publication (the second paper is now in press). But let’s be clear: I did not decide I liked KIND because the company funded research in my lab. Rather, they funded research in my lab after I decided I liked them, felt their product deserved to be studied for its health effects, and approached them about sponsorship. In general, all the wrong concerns tend to be raised about research sponsorship. Anyone who thinks a vested interest should never fund research is something of a hypocrite if they have ever been to a pharmacy; virtually every drug at our disposal got there via pharmaceutical industry research funding. What matters to the reliability of research findings is the methods that guard against bias, not the existence of bias in funder, or researcher. I have been biased, meaning I was hoping for a particular outcome, with every study I have ever run- whether the bills were paid by a foundation, a company, the NIH, or the CDC. Why run a study when you don’t care how it turns out? I always care, and that, by definition, is bias. We thus build in methods to make sure such inevitable researcher bias does not result in biased research measures. As for the outcome of those KIND bar studies: both were positive, demonstrating benefits related to cardiometabolic health, appetite, weight and body composition. The science we have lines up quite well with both common sense, and the company’s intentions: these are healthy snacks. Which brings us back to the conflict with the FDA. In brief, KIND received a letter of reproach from the FDA for use of the word “healthy,” on the back and in small print, on four of their snack bar wrappers which in a very specific way fail to qualify, under the FDA definition, for use of that descriptor. What particular way? They exceed the allowable gram of saturated fat per serving. I have addressed the topic of saturated fat before, more than once, and will spare us any lengthy excursion into those weeds on this occasion. Suffice to say that I agree an excess of saturated fat intake remains a common and relevant concern in the typical American diet, and that FDA rules to help defend against that excess make sense in principle. But in this case at least, not in practice. The intent of the regulatory language is clearly to guard against the addition of saturated fat per se, as cream, butter, or oil, to a processed food recipe. The pros and cons of that approach could be debated, but it is defensible. Are there such oils added to KIND bars? Not a drop. Rather, the fat in the KIND bars in question comes entirely from the nuts, notably almonds, which are a major ingredient. So, for instance, KIND almond and apricot bars have 10 grams of total fat, and 3.5 grams of saturated fat, coming almost entirely from the first ingredient, almonds, with perhaps just a tiny bit from the second ingredient, coconut. There is, otherwise, no added oil. This begs the obvious question: if the fat (and saturated fat) in these KIND bars is the reason they can’t be called “healthy,” and if this fat (and saturated fat) is entirely, or nearly so, from almonds- does this mean that almonds shouldn’t be called “healthy”? Any such notion is, of course, absurd. There is a voluminous, robust scientific literature (see citations below) showing that almonds, walnuts, and nuts in general confer consistent and quite significant health benefits. Regular intake of nuts has even been associated with a marked reduction in all-cause mortality risk. If that is not the very definition of “healthy” food, I have no idea what could be. So what’s really going on here? The failure of one-size-fits-all-regulation to, in fact, fit all; and the ineluctable law of unintended consequences. The FDA is a federal agency, and its principal tool is regulatory rules. Dealing with the entire expanse of food and drugs, the FDA tools tend toward the blunt, rather than the surgically sharp. While a numerical threshold for saturated fat as an added ingredient might make some sense, it makes no sense to apply that same regulation to a wholesome, whole food ingredient known to have a healthy overall portfolio of fat content, and decisively good health effects. When almonds, as the first ingredient in a snack, are the reason that snack cannot be called “healthy,” you are well into the realm of unintended consequences. I can pretty much guarantee no such occurrence was envisioned when the regulatory language was drafted. In addition to nuts, by the way, that same standard threshold for saturated fat would preclude calling hummus, wild salmon, or raw avocado “healthy.” With all due respect to my friends with the feds, that’s- well- nuts. One more thing to chew on here. 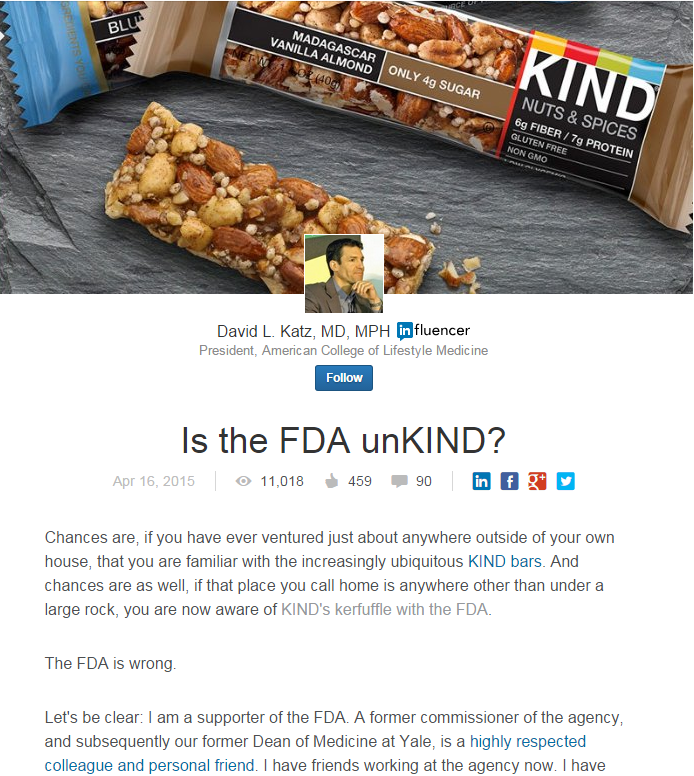 Does anyone think that some agent at the FDA with nothing better to do just suddenly, and spontaneously, decided to scrutinize the back of KIND bar packages on the off chance something in the fine print had gone unnoticed? I don’t. I have no inside information here, but I can read the writing on the wall, as well as on a food wrapper. KIND has, as noted, grown all but ubiquitous, and for good reason. While such success fosters many claims of friendship, it fosters even more disgruntled adversaries among competitors losing market share to you. I am pretty sure some such party, looking for any way to slow KIND’s momentum, legitimate or otherwise, jangled the FDA’s chain. I confess it’s just conjecture on my part, but ponder as the spirit moves you. Almonds are, in fact, healthy. Walnuts are healthy. Nuts in general, hummus, and avocado- are all healthy. KIND bars, too, made principally from nuts and fruit, are healthy. If a regulation on the books precludes saying so, that doesn’t make the statement untrue; it makes the regulation inappropriate as applied. The regulation, though, is the regulation; and the FDA was just doing its job. I don’t think the agency was being… unkind. I just think they got it wrong. 1: Mohammadifard N, Salehi-Abarghouei A, Salas-Salvadó J, Guasch-Ferré M, Humphries K, Sarrafzadegan N. The effect of tree nut, peanut, and soy nut consumption on blood pressure: a systematic review and meta-analysis of randomized controlled clinical trials. Am J Clin Nutr. 2015 Mar 25. pii:ajcn091595. [Epub ahead of print] PubMed PMID: 25809855. 2: Berryman CE, West SG, Fleming JA, Bordi PL, Kris-Etherton PM. Effects of daily almond consumption on cardiometabolic risk and abdominal adiposity in healthy adults with elevated LDL-cholesterol: a randomized controlled trial. J Am Heart Assoc. 2015 Jan 5;4(1):e000993. doi: 10.1161/JAHA.114.000993. PubMed PMID: 25559009; PubMed Central PMCID: PMC4330049. 3: Jamshed H, Gilani AH. Almonds inhibit dyslipidemia and vascular dysfunction in rats through multiple pathways. J Nutr. 2014 Nov;144(11):1768-74. doi: 10.3945/jn.114.198721. Epub 2014 Sep 24. PubMed PMID: 25332475. 4: Abazarfard Z, Salehi M, Keshavarzi S. The effect of almonds on anthropometric measurements and lipid profile in overweight and obese females in a weight reduction program: A randomized controlled clinical trial. J Res Med Sci. 2014 May;19(5):457-64. PubMed PMID: 25097630; PubMed Central PMCID: PMC4116579. 5: Ukhanova M, Wang X, Baer DJ, Novotny JA, Fredborg M, Mai V. Effects of almond and pistachio consumption on gut microbiota composition in a randomized cross-over human feeding study. Br J Nutr. 2014 Jun 28;111(12):2146-52. doi: 10.1017/S0007114514000385. Epub 2014 Mar 18. PubMed PMID: 24642201. 6: Ley SH, Hamdy O, Mohan V, Hu FB. Prevention and management of type 2 diabetes: dietary components and nutritional strategies. Lancet. 2014 Jun 7;383(9933):1999-2007. doi: 10.1016/S0140-6736(14)60613-9. Review. PubMed PMID:24910231. 7: Jackson CL, Hu FB. Long-term associations of nut consumption with body weight and obesity. Am J Clin Nutr. 2014 Jul;100 Suppl 1:408S-11S. doi: 10.3945/ajcn.113.071332. Epub 2014 Jun 4. PubMed PMID: 24898229; PubMed Central PMCID: PMC4144111. 8: Luo C, Zhang Y, Ding Y, Shan Z, Chen S, Yu M, Hu FB, Liu L. Nut consumption and risk of type 2 diabetes, cardiovascular disease, and all-cause mortality: a systematic review and meta-analysis. Am J Clin Nutr. 2014 Jul;100(1):256-69. doi: 10.3945/ajcn.113.076109. Epub 2014 May 21. PubMed PMID: 24847854. 9: Bao Y, Han J, Hu FB, Giovannucci EL, Stampfer MJ, Willett WC, Fuchs CS. Association of nut consumption with total and cause-specific mortality. N Engl J Med. 2013 Nov 21;369(21):2001-11. doi: 10.1056/NEJMoa1307352. PubMed PMID: 24256379; PubMed Central PMCID: PMC3931001. 10: Toledo E, Hu FB, Estruch R, Buil-Cosiales P, Corella D, Salas-Salvadó J, Covas MI, Arós F, Gómez-Gracia E, Fiol M, Lapetra J, Serra-Majem L, Pinto X, Lamuela-Raventós RM, Saez G, Bulló M, Ruiz-Gutiérrez V, Ros E, Sorli JV, Martinez-Gonzalez MA. Effect of the Mediterranean diet on blood pressure in the PREDIMED trial: results from a randomized controlled trial. BMC Med. 2013 Sep 19;11:207. doi: 10.1186/1741-7015-11-207. PubMed PMID: 24050803; PubMed Central PMCID: PMC3849640. 11: Pan A, Sun Q, Manson JE, Willett WC, Hu FB. Walnut consumption is associated with lower risk of type 2 diabetes in women. J Nutr. 2013 Apr;143(4):512-8. doi: 10.3945/jn.112.172171. Epub 2013 Feb 20. PubMed PMID: 23427333; PubMed Central PMCID: PMC3738245. 12: Katz DL, Davidhi A, Ma Y, Kavak Y, Bifulco L, Njike VY. Effects of walnuts on endothelial function in overweight adults with visceral obesity: a randomized, controlled, crossover trial. J Am Coll Nutr. 2012 Dec;31(6):415-23. PubMed PMID: 23756586; PubMed Central PMCID: PMC3756625. 13: Ma Y, Njike VY, Millet J, Dutta S, Doughty K, Treu JA, Katz DL. Effects of walnut consumption on endothelial function in type 2 diabetic subjects: a randomized controlled crossover trial. Diabetes Care. 2010 Feb;33(2):227-32. doi: 10.2337/dc09-1156. Epub 2009 Oct 30. PubMed PMID: 19880586; PubMed Central PMCID: PMC2809254. 14: Trichopoulou A, Bamia C, Trichopoulos D. Anatomy of health effects of Mediterranean diet: Greek EPIC prospective cohort study. BMJ. 2009 Jun 23;338:b2337. doi: 10.1136/bmj.b2337. PubMed PMID: 19549997; PubMed Central PMCID: PMC3272659. 15: Allen LH. Priority areas for research on the intake, composition, and health effects of tree nuts and peanuts. J Nutr. 2008 Sep;138(9):1763S-1765S. PubMed PMID: 18716183. 16: Jiang R, Manson JE, Stampfer MJ, Liu S, Willett WC, Hu FB. Nut and peanut butter consumption and risk of type 2 diabetes in women. JAMA. 2002 Nov 27;288(20):2554-60. PubMed PMID: 12444862. 17: Luu HN, Blot WJ, Xiang YB, Cai H, Hargreaves MK, Li H, Yang G, Signorello L, Gao YT, Zheng W, Shu XO. Prospective Evaluation of the Association of Nut/Peanut Consumption With Total and Cause-Specific Mortality. JAMA Intern Med. 2015 Mar 2. doi: 10.1001/jamainternmed.2014.8347. [Epub ahead of print] PubMed PMID: 25730101.